Direct Lease Driver of the Month, Stephen Moskowitz, Oceanside, Calif., is a veteran driver with nearly 30 years of experience as a professional household goods mover. Steve has a great driver rating and this is his eighth Driver of the Month award with the van line. Edward Fetters, Moving Relocation Specialists, Las Vegas, Nev., earned Wheaton’s Permanent Fleet Driver of the Month award. Ed is another veteran driver with our company with more than 30 years of experience as a professional mover. 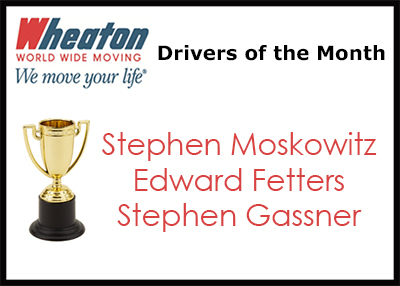 Ed has been frequently selected as Driver of the Month with this being his 22nd award. Ed also was chosen as Driver of the Year in both 1992 and 1999. Stephen Gassner, Olympic Moving & Storage III, Lakewood, Wash., earned Wheaton’s Intermittent Fleet Driver of the Month award. Steve maintains an excellent performance rating and is yet another veteran driver with more than 43 years of experience as a professional mover. This is his first Driver of the Month award with our company.